The Little Sugar Farmhouse has been in our family since the early 1900's. It was purchased by our Great Grandfather and the original part of the house is 100 years old. We grew up in the summers swimming in the creek and running around the woods while our Grandparents raised cattle, pigs, chickens and hay. We were raised in Dallas but always have come back to our farm for summers and holidays. We have fully renovated the house to provide a beautiful country escape for our families as well as yours. The Little Sugar Farmhouse is near the Elk River which is a popular for canoeing, kayaking or rafting. The University of Arkansas is only 45 minutes away which makes it a perfect spot for a football weekend get-a-way. The Mark Twain national forest is not far from the farmhouse as well as an hour drive to Branson for concerts and of course the fabulous Silver Dollar City. The Little Sugar Farmhouse is central to popular casinos, water sports, Northwest Arkansas attractions and dining including the Crystal Bridges Museum. Make the Little Sugar Farmhouse your peaceful country retreat. Access to so many opportunities while still having a country experience. Enjoy!! We are two sisters who inherited the family farmhouse and 376 acres in 2006 after our Grandfather passed away. Jana is currently a realtor and floral designer from Dallas, Texas with 3 children ages 23, 20 and 16 and Niki is a Flight Attendant for Delta Airlines with 2 children ages 12 and 8. We spent all our summers at the farm with our grandparents who taught us the value of family, community and hard work and now we love to share our passion for gathering with others by creating a place for retreats, reunions and relaxing vacations. We both live in the city but love the country and this farm is our way to share our heritage with others. After we inherited the farm we realized after 100 years of this property owned and managed by our Great Grandfather and Grandfather with help from our Dad that we had to keep this country retreat in the family. Jana plans to develop our barns into an event/retreat space in the near future and the farmhouse is perfect for people from all walks of life. We are so grateful that we can keep the farm in our family and let our future generations enjoy what we have and can share it with others. We enjoy traveling down the dirt road to enter a slower lifestyle that most of us don't experience anymore on a daily basis. The farmhouse offers us a retreat from the demands of a hectic lifestyle. However, the farmhouse is close enough to Northwest Arkansas for shopping, dining and nightlife. We also enjoy several very unique local businesses in McDonald county that add charm to the country experience as well as many outdoor attractions including the Elk River, Big Sugar Creek and Mark Twain Forest located minutes from the farmhouse. The farmhouse sits on the corner of 376 acres. A large amount is leased to a local rancher. This is a working farm and at times you may get a glimpse of what life in the country is really like. Cattle roam in the distant fields, beavers scurry across the yard and if your lucky you may even see deer crossing over the road to enjoy the creek! 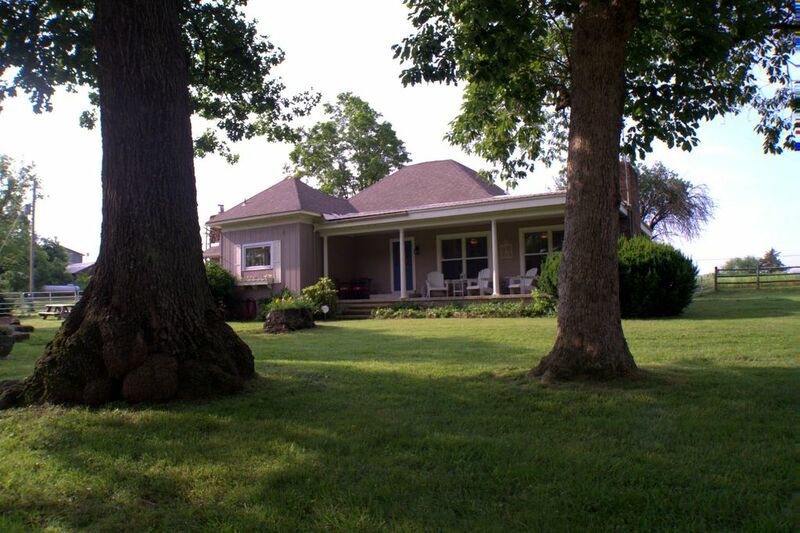 Our farmhouse is located on our 376 acre farm set in rural Missouri. The Little Sugar Creek sits right across the country road in front of the house. Our kitchen is stocked with pots and pans as well as a crock pot, blender, mixer and coffee/salt/pepper and basic spices. cable and Wifi available June 1st thru December 31st of every year. We had a wonderful time at the Little Sugar Farmhouse. The house is very nice and much larger than I expected. The kitchen and electronics are modern and great. Definitely recommend. Peaceful, lovely, and all around perfect! This home is the perfect place for our get-away to the river. We love the layout of the home for giving each family its own space. We love the proximity to the river, which is a small walk through a little meadow. It keeps kids from being in and out of the water all day - instead, we just stay IN all day!!! We love the owners and the caretaker, who are all great with the communication and the welcoming feeling. In short, we love the Little Sugar Farmhouse! Thank you so much Heather! We love having ya’ll as repeat guests and are so very grateful for your continued visits to our farm and farmhouse!! Sharing our special family heritage is such a privilege to have and share with others. We look forward to your visits in the future! We loved the rural atmosphere and quiet. Grandchildren enjoyed the creek and it was so nice to have everything we needed available. Lots of space. Sulphur odor of water took getting used to but Jana provided plenty of drinking water. Thanks for everything. Perfect setting and accommodations for our group.....plan to return next year! We are a small group of men/close friends (in our early forties now) that have been doing an annual golf/canoe/casino/hijinks trip for many years now around the Elk River and surrounding Southern MO areas. We turned to the Little Sugar Farmhouse as an alternative to camping this year…..after our campsite was nearly wiped off the map with torrential flooding and tornadic activity the prior year (many pup tents were lost in that struggle). The Farmhouse was perfect for our crew this year. Each man had access to a separate bed (which has been crucial for us past the age of ~23), the layout of the house was spacious with many seating options, the kitchen was well equipped and kitchen island served as a perfect make-shift bar in our frequent trips from the fire pit to refresh our drinks. The fire pit was also a highlight of our stay. Both evenings and well into the early morning hours were spent around it. It was a perfect distance away from the house itself….close enough to the refreshments, but just far enough away from the house to escape the noise if you wanted to turn in a bit early. As others have said, we enjoyed the location of the house itself too. You feel like you are in the middle of the country while sitting around the fire pit hearing coyotes (I think) in the distance - but if you forgot your YETI, you could be at Wal-Mart in less than 10 minutes shopping for an Ozark Trail replacement. And the access to the river itself is just across the street and then a short walk….plenty of sand bar space there to set up a chair, take in the views and enjoy the water - or just put your chairs in the water like we did. As some others have pointed out, there is a sulphur smell to the well water that feeds into the house - but it’s certainly not a show stopper. A minor inconvenience for this group that used to go literally days without showering in the early years of this annual trip. Jana - we appreciated your hospitality - and look forward to returning next year! Thank you so much for your kind words and review! We loved having ya'll and look forward to your visit next year!! We booked a weekend to reunite our 5 kids and their plus ones ..Skipping rocks at the creek ... Smores at the fire pit. .. swinging on the tire swing... A variety of spaces that allowed family to spread out and catch up with each other. Everything was there pans . Dishes ..towels .. wi fi .. 2 TV's we had movie s going in both spaces.. games ... plenty of beds and bathrooms.. It was amazing to have that many people so much space to spread out take some quiet to yourself or chose to be in the middle if it all We are making plans for family fun weekend 2018 !! We enjoyed our time on the Little Sugar so much! Having this lovely home base made it even more fantastic. The house was well furnished and a close walk to river access. We tubed the Little Sugar for two days without having to shuttle for more than 1/2 mile! It was great! We did forget that water in this area of MO is quite sulfur-y, but the store is so close we did a run for drinking water and everything was good. In fact, it's really cool that we felt so "out in the middle of nowhere", but knew we could run to civilization for nearly anything we needed in about 5 minutes! I mention this not in any way as a negative to the house - we've frequented this area a lot and it is what it is. Just a note for others to pack the water if it's an issue! The house was open and spread out, giving everyone a sense of their own space. They took care of the couple of items that came up very quickly, giving us an easy, happy weekend on the river! It really was fantastic and we are very thankful that they share this home! Thank you so much Heather for your review! We so enjoy being able to have our family farmhouse as a fun and relaxing place for families and groups like yours. Thank you for your business and we hope we can host you in the near future! One night free with a full week rental. Full refund up to 15 days before arrival date, Partial refund the week before the arrival date NO refund the week of the arrival date. Damage deposit will not be returned if more guests stay at the house than listed on vrbo and our agreement. Damage deposit will not be returned unless all check out procedures are followed including proper disposal of trash. NO PETS or the damage deposit will be forfeit.